Hi, everyone, hope everyone is enjoying the new interview format for my monthly round-up post for the New Embroidery with Vintage Patterns (NEwVP) stitch-alongs (SALs). I think it is really fun and interesting to get to know some of the people behind the stitches! (If there are questions you wish I was asking, please let me know in the comments!) This month, instead of featuring someone who participated in the monthly SAL, I am featuring someone who created a gorgeous, one-of-a-kind quilt using thrifted vintage embroidery pieces! As always, I invite all of you to join our New Embroidery with Vintage Patterns group or at least stop by and take a peek. There are lots of new embroideries with vintage patterns being added on a regular basis that are totally unrelated to any monthly SAL. Plus, since I'm doing an interview format now, I'm not able to show-off all the beautiful SAL stitcheries in our photo pool! I am a retired bookkeeper, happily married to my bestfriend for 44 years. We have 3 children and 7 grandchildren. I am a quilter, antique quilt collector, student of quilt history, and a vintage quilt and linens rescuer. 2. How long have you been embroidering/sewing/quilting? What or who got you started? From my earliest memories sewing of some kind has been in my soul and spirit. I often wonder where it came from. I am an only daughter of an only daughter, with grandparents long gone by the time I was born in 1950. My mother was the typical housewife of the late 40’s and 50’s. My only exposure to sewing from her was sewing on a button, if anything more was needed it was done by a seamstress in our little hometown in Missouri. I was always digging for scraps of fabric from the “rag bag” to make doll clothes for my Barbie, all by hand. At thirteen my mother bought me a sewing machine for my birthday. I took sewing classes in junior high and high school. I enjoyed making clothes for myself, decorating for my home and making clothes and costumes for my children. In the 1990’s I discovered quilt making. I immediately became very passionate about quilts. 3. What attracts you to vintage embroidery patterns or other vintage items? I like a lot of vintage things, I think it must have to do with my childhood in the 1950s. I remember always loving embroidery. I did pillowcases in my teens. 4. Okay, let's talk about that gorgeous quilt photo that you recently added to the NEwVP photo pool. First, I see that you are wearing a ribbon on your shirt and there is a big beautiful red ribbon your quilt, where were you and what honor (award) did you receive? 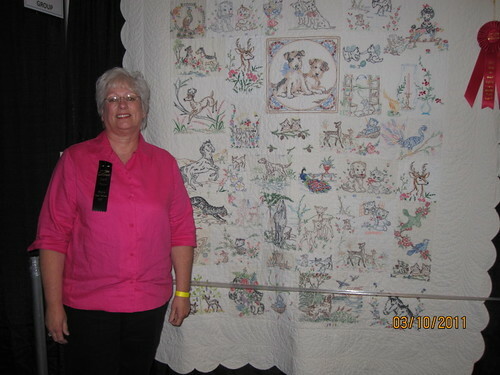 The quilt was shown at the 2011 Arizona Quilters Guild show in Phoenix. It won a 2nd Place Ribbon in the group category. I entered in the group category because I did not embroidery any of the blocks. Many women were involved in making all the embroidery on the quilt. 5. 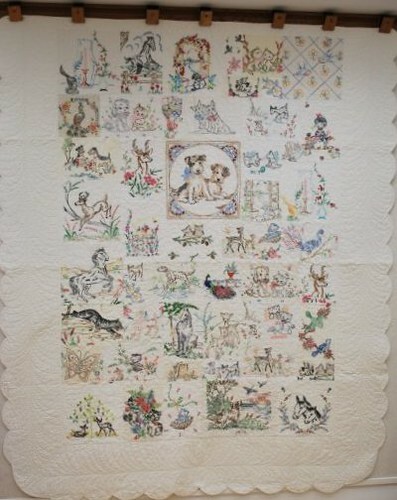 What inspired you to turn all those vintage embroideries into a quilt? For the last 12 years or so I have been collecting antique crib quilts. I have an obsession with all the embroidery quilts full size and small. So I would also purchase finished or unfinished embroidery quilt blocks and then that lead to dresser scarves, table cloths and pretty much anything that was embroidery. Well you can only use so many dresser scarves around the house. I am not really into clothing; I have seen people make vests from old linens. I knew for a long time I wanted to make a quilt with my collection and one day I was totally inspired to make this quilt. I took out all the things I had with animals. Then just cut them in a size divisible by 4. I have done T-shirt quilts based on this technique. Most dresser scarves have two embroidery sides, but I only used one side in the quilt. So there would be a large variety of designs. I like random set quilts. 6. You tease us in by saying you have "several more" quilts planned and that you have a large collection of vintage embroidery! Tell us about your large collection of vintage embroidery. Are you finding these pieces at thrift stores or antique shops? Are any of them from your own family? Do you get really excited when you find vintage embroideries? Any particular themes planned for your future quilts?? I love going to antique stores, but right now I am trying to not buy anymore. I really want to use the ones I have. After the animal quilt, I sorted my embroidered pieces into several categories, flowers, peacocks, houses, women, and children. I have some patriot items I really am excited by right now. Even being retired, there is just never enough time to do all you want. And somehow I need to be inspired by a design. For me that is not easy. 7. You took some close-up photos of the quilt in your flickr photostream, specifically, the following two below. Are these some of your favorite stitchy images on the quilt? If so, why? I have to say dogs are my favorite; those two little guys are so cute. 8. When your not re-purposing vintage embroideries and turning them into drool-worthy quilts, what kind of embroidery do you do? My favorite embroidery is redwork. Ones with a vintage feel. I have lots of redwork blocks I need to make into a quilt. 9. Do you have a favorite embroidery stitch? if so, why? With redwork it tends to be the stem stitch. But I think the backstitch looks great with redwork. 10. Do you have a favorite DMC (or other brand) floss color? If so, what is the color name & number? DMC 498 is the one I use the most, but I also like 304. 11. In your home, where do you usually sit to stitch? Do you like it to be quiet while you stitch, or do you watch tv, listen to the radio, or talk on the phone while you stitch? I usually embroider in the evening while watching TV with my husband. I like to have my hands busy. 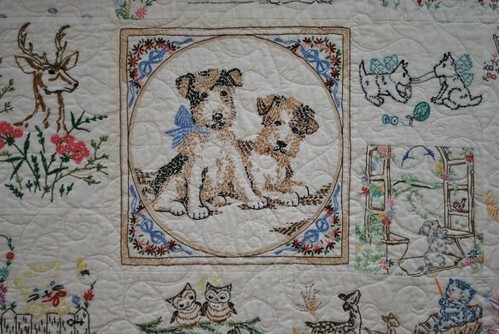 I do have a blog called Quilts Vintage and Antique. I have just started adding patterns for some of the vintage quilts I own. I hope to do more of that in the future. I also started a group on Facebook called Quilts-Vintage and Antique. It started as a photo album, a virtual museum of antique and vintage quilts. 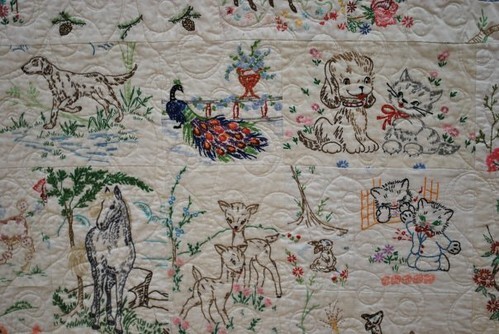 Anyone can join and share photos of their antique and vintage quilts. I know the quilts I love and collect will never end up in a museum, but I love to share them. I figured there were a lot of people who felt the same. 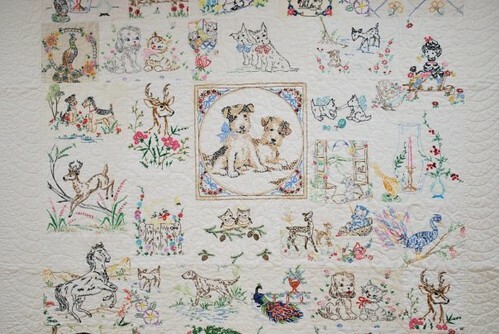 It has now turned into a great site for information on antique quilts. It is going strong with over 800 members. Thanks for taking the time to read my post and meet just one of the many terrifically talented stitchers in our NEwVP group! Please do stop by to visit and join our group! Also, have you heard the news that the NEwVP group will be hosting another fantastic new embroidery with vintage patterns contest?! Oh yes! Interviews with all EIGHT (!!!) new prize sponsors have been posted here along with photos of what each prize sponsor is donating! The official contest announcement with contest categories, rules, details, etc..... will be posted in a brand new discussion post in the NEwVP group shortly after Christmas! Hope your and yours have a wonderful holiday season!